RBTH presents a selection of views from leading Russian media on the latest developments in Ukraine, including the resumption of talks between Russia, Ukraine, Germany and France on resolving the armed conflict in southeast Ukraine, the Russian aid convoy on the Ukrainian border, and nationalist Right Sector leader Dmytro Yarosh's threat to stage "a march on Kiev." The heavyweight Kommersant daily reports about the difficult progress being made in the four-way talks between the foreign ministersof Russia, Germany, France and Ukraine that resumed on Sunday, for the first time since early July. "The resumption of talks in the four-party format was necessitated by an escalation in the conflict in the east of Ukraine and its growing costs for all the sides involved," writes the newspaper. The publication goes on to stress that despite the fact that all the parties to the talks understand the need to find a political solution to the conflict, there is a striking difference in their views on how this conflict may be resolved, so any significant progress is still a long way away. The author quotes Ukrainian pundit Vladimir Fesenko as saying that "diplomatic efforts being undertaken in the four-party format should be aimed at arranging a meeting between presidents Putin and Poroshenko to discuss the whole range of the most acute issues in bilateral relations." The expert is convinced that there is no way that Kiev will agree to freezing the conflict in the southeast of the country and recognizing pro-autonomy militia leaders as subjects in the talks but could, if necessary, agree to a decentralization of power that would involve the Donbass being given a special status. 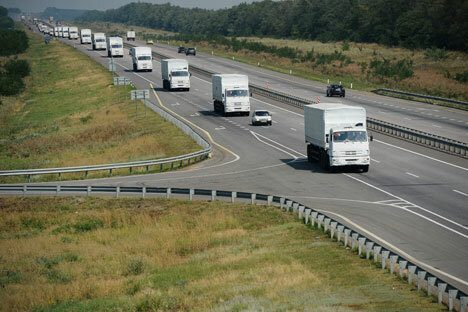 Ukraine has at last recognized the cargo in the Russian convoy currently parked on the border between the two states as humanitarian aid and the parties have managed to agree on the procedure for customs clearance and inspecting the cargo, reports Expert magazine. Having said that, the article continues, one can still "not rule out surprises" from the Ukrainian side, especially since fighting in the Donbass is continuing and Ukrainian troops are on the offensive, shelling towns in the east of the country with heavy weapons. According to Expert, the humanitarian cargo may be delivered as soon as Monday or Tuesday this week. In another piece on the Russian humanitarian convoy, Vzglyad author Marina Baltacheva accuses Kiev of deliberate delays in delivering the cargo: "Nearly a whole week has passed,” she writes. “Aid for Donbass residents has still not been delivered and the blame for it lies fully on the Ukrainian side, which is doing everything possible to prevent the cargo from crossing the border." Gazeta.ru reports about a conflict between the head of the nationalist Right Sector movement, Dmytro Yarosh, and Kiev. On Sunday, Yarosh issued an ultimatum to President Petro Poroshenko, threatening to stage "a march on Kiev" unless the authorities stop unlawful detentions and beatings of activists and carry out a reform inside the Ukrainian Interior Ministry. By the evening of the same day, Yarosh had withdrawn the ultimatum, saying that some of his demands had been met. Gazeta.ru quotes Ukrainian journalist Anatoly Shariy as suggesting that Yarosh's surprising outburst was in fact instigated by influential Ukrainian tycoon and Dnepropetrovsk Region governor Ihor Kolomoyskyi: "Clearly, his decision [to present Poroshenko with an ultimatum – RBTH] was not an independent one. I am not sure if Yarosh ever makes independent decisions…" If the Ukrainian president "caves in" to pressure from the tycoon who sponsors nationalists, that "would be the end of him", Shariy concludes. In the meantime, political analyst and journalist Boris Mezhuyev, in an op-ed for the pro-Kremlin Izvestia daily, explores the genesis of the conflict in eastern Ukraine and concludes that it is based on a clash of civilizations. In his opinion, Ukraine is "an undecided state, split along the civilizational principle", with one part of the country leaning towards the West and the other towards Russia. Mezhuyev compares Ukraine to the former Yugoslavia, a country that perished precisely as a result of a conflict between people adhering to profoundly different cultural and historical values. He points out that in the modern world, "the 'territorial integrity' of nations leaning towards different civilizations will always be unstable."